Catholic Churches, especially in the former predominantly Catholic areas in the northeast, are closing or merging and have been doing so for the past decade. Some dioceses and some pastors are doing a better job of keeping parishioners informed than others, but the approach of those involved does not change the reality. We have more churches than we need for the number of practicing Catholics. So, demographics is the primary driving force behind the decisions. People understand this. 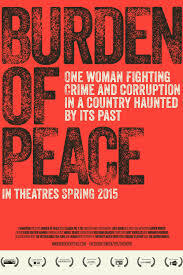 BURDEN OF PEACE: The story of one woman's fight, Claudia Paz Y Paz, Attorney General for 4 years, to bring justice to the long history of genocide and corruption in Guatemala. This was sponsored by the PEI Chapter of Breaking the Silence. A clip of this film can be seen on YouTube. US AND THEM: A powerful documentary of the filmmaker Krista Loughton's personal journey befriending homeless and addicted street people. A clip of this film can be seen on YouTube. On Monday May 8th, the health care coordinators from Toronto, Kingston, Montreal and Sydney, along with Nina Glinski and Catherine Walker and the members of the WHRT arrived at Providence Mother House to begin their annual gathering. After some time together with prayer and reflection, they had a relaxing social evening with the CND Sisters in residence. All enjoyed the time together meeting one another or renewing acquaintances. A special moment occurred when the three jubilarians, Nina Glinski and Eileen Roach celebrating their 50th and Yvonne Hutchinson her 60th were honoured.